(1) DW745 10-inch table saw, (1) 10-inch 24-tooth carbide blade, (1) miter gauge, (1) push stick, (1) blade guard, stands are sold separately. When gathering detailed information about the DeWalt DW745 table saw, we found out that the unit’s fence makes this one of the more popular table saws in the marketplace. This is because the fence easily snaps into place, making it easy to rip a variety of flooring materials including hardwoods and pressure-treated lumber. The DeWalt DW745 portable 10-inch jobsite table saw is extremely handy due to its easy portability and small size. 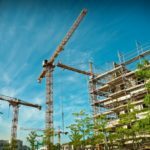 In fact, the unit is easily transported to any work site. In addition, it offers a phenomenal fence that requires no time to set it up, while still providing extremely accurate and smooth cuts. 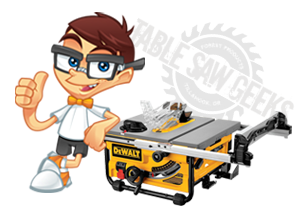 In fact, the DeWalt table saw cutting performance is one of the best we have witnessed, cutting a variety of materials including trim work, molding, planks, shelving and cabinet pieces. With the maximum rip of 16 inches, this phenomenal portable table saw can cut various trim work and large-size shelving material. The base of the metal roll cage on the saw is extremely durable, especially compared to the traditional plastic bases found on a variety of competitive models. The fence adjustment on the table saw is smooth, accurate and quick because of its patented rack and pinion fence rail. Like many of the unit sold by DeWalt, the DW745 is manufactured with its Site-Pro Modular Guarding System. Its versatility provides easy set up for numerous applications, using tool free adjustments of the units guarding components. Setting an exclusive fence configuration allows the user an additional large ripping capacity of 20 inches. 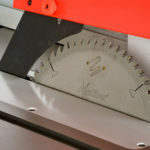 In addition to the oversize ripping capacity, the table saw features a 90 degree cut depth of 3-1/8 inches, and a 45 degree cut depth of 2 ” inches. Coated for reduced friction, the table surface improves cut quality. Its powerful high torque, 15 amp motor delivers all necessary power for cutting through dense woods at lightning, accurate speed. The DeWalt DW745 10 inch blade maxes out at 3850 RPM (no load speed) for clean, quick cuts in a variety of applications. Weighing in at just 45 pounds, the DeWalt on-site portable table saw makes transporting it to the work site easy. As an added convenience, the attached storage system keeps all components safe, and close at hand. The dust collecting port the back of the unit allows easy connection to an efficient dust extraction system, or the garage shop vac to make cleanup a breeze. Out of the box, the DeWalt DW745 job site 10-inch table saw includes the unit, 24 to carbide 10-inch blades, push stick, meter gauge and a blade guard. The mechanism is designed to fit securely on table stand surfaces. The housing is designed to fit snugly on the stand base, while the modular guard system provides the ultimate protection for fingers and hands. The tool free adjustments offer quick and easy alterations to make the ideal, accurate cut through a variety of materials. When finalizing our DeWalt DW745 table saw review, we concluded that this unit is highly recommended to any amateur or professional wanting accurate cuts by a solid machine sold at an affordable price. The unit is lightweight, easy to adjust, and comes with all necessary features to provide the best outcome when cutting plywood, softwood, hardwood, and pressure-treated lumber.